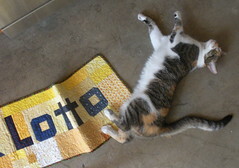 Lovely cat and lovely banner. I'm in awe at the speed the members of this blog finish things! Great Photo and exquisite crinkles, post wash!! I'd like to join block lotto. Can't find your email address on the blog, so hopefully this will suffice. I have my blocks done for January – hopefully I'm not too late to join. Krista, your account is "no reply" so I cannot reply to you via email. Please email me at jeansophie (at) gmail (dot) com. You'll need to send me your name and postal mailing address. Then I'll generate an invitation for you to become an author on our group blog and you can post a photo of your blocks. (No you're not too late–the deadline is Sunday). I can't wait to see them! (and you WILL be pushing us to the FIVE WINNER mark this month. Woo hoo! Sophie, I think it looks great. 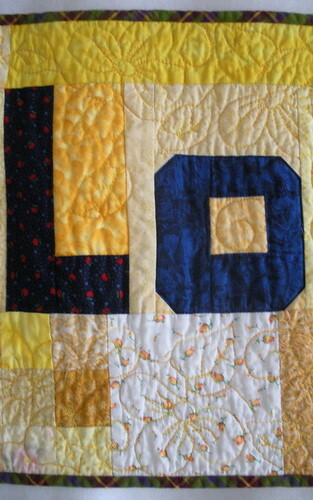 Wonderful quilting and I love the crinkled look. LOVE the banner Sophie! You did a great job on it and a beautiful job of quilting. It looks great on the blog!